Global Sentiments Cheer Markets, Sensex Surges Over 160 Points. Healthy growth in Chinese exchanges and the US economy, coupled with attractive valuations. Mumbai: Healthy growth in Chinese exchanges and the US economy, coupled with attractive valuations, buoyed investor sentiment in Indian equity markets on Friday. Bullish sentiments propelled the barometer 30-scrip sensitive index (Sensex) of the Bombay Stock Exchange (BSE) to gain the 161 points or 0.61 percent. Positive sentiments were also witnessed at the wider 50-scrip Nifty of the National Stock Exchange (NSE). The CNX Nifty of the NSE rose 53 points or 0.67 percent to close at 8,001.95 points. The S&P BSE Sensex, which opened at 26,542.84 points, closed at 26,392.38 points -- up 161.19 points or 0.61 percent from the previous day's close at 26,231.19 points. Analysts point out that the positive cues eminating out of Chinese markets and strong economic growth data from the US cheered the markets. "The rally from yesterday has been extended on the back of strong US GDP data, which was better-than-expected. This led to a strong closing in the US markets on Thursday," Anand James, co-head, technical research, Geojit BNP Paribas, told IANS. The US economy expanded by 3.7 percent in the quarter ended June, which was better-than-expected, given the earlier estimate of 2.3 percent. The rise in growth rate supported the US markets which made healthy gains on Thursday. Thursday's growth in the US markets was build-upon the gains achieved on Wednesday, when the exchanges had made their biggest single day gains in four years. The Chinese markets too showed signs of recovery after People's Bank of China injected $9.39 billion into interbank money market and the securities regulator said that it will tighten profit margin controls to curb speculations. The benchmark Shanghai Composite Index closed 4.90 percent up on Friday. It had closed with gains of 5.40 percent on Thursday, after a five consecutive days of losing streak. "The Asian markets have also been on the positive side and this has provided relief and support to the Indian equities. Rupee is also stabilising," James added. The massive implosion in the Chinese markets which has by some estimates eroded 40-45 percent of the entire stock value coupled with yuan devaluation and lower factory out spooked the world markets. This caused the steepest fall in the Indian barometer index on Monday. The S&P BSE Sensex had lost as much as 1,624.51 points, or 5.94 percent -- which was the steepest in terms of points. Friday's gains were in a way spurred by the massive fall on Monday. As the crash had sharply reduced prices and gave an opportunity for value buying by the domestic investors, said Devendra Nevgi, chief executive of ZyFin Advisors. "The market correction has sharply reduced prices and led to value buying at lower levels. This supported the ongoing positive bias in the market," Nevgi elaborated to IANS. US GDP and job growth data coupled with increase in retail sales and house purchase markets has heightened chances of a US rate hike in September. The US Fed will decide on the issue of raising key lending rates after a decade or so of ease money regime with interest rates being at zero during at its policy meet scheduled on September 16-17. High interest rates in the US are expected to lead away the foreign portfolio investors (FPIs) from emerging markets like India. It also expected to dent businesses margins as access to capital from the US will become expensive. All eyes are also set on global central bank chiefs meet at Jackson Hole, a ski resort located along the border of Wyoming and Idaho for the Federal Reserve’s annual retreat. Other triggers for the coming week will be domestic and will start with India's GDP figures followed by the PMI (Purchasing Managers' Index) data. Sector-wise, healthy gains were made in automobile, information technology (IT), technology, entertainment and media (TECK), oil and gas and metals. However, healthcare, banking and consumer durables sectors came in for heavy selling pressure. The S&P BSE automobile index increased by 179.71 points, the IT index augmented by 167.01 points, TECK index gained by 105.96 points, the oil and gas index rose by 80.13 points and the metals index edged-higher by 56.65 points. On the other hand, healthcare index plunge 52.96 points, banking index receded by 46.15 points and consumer durables sector was lower by 42.20 points. 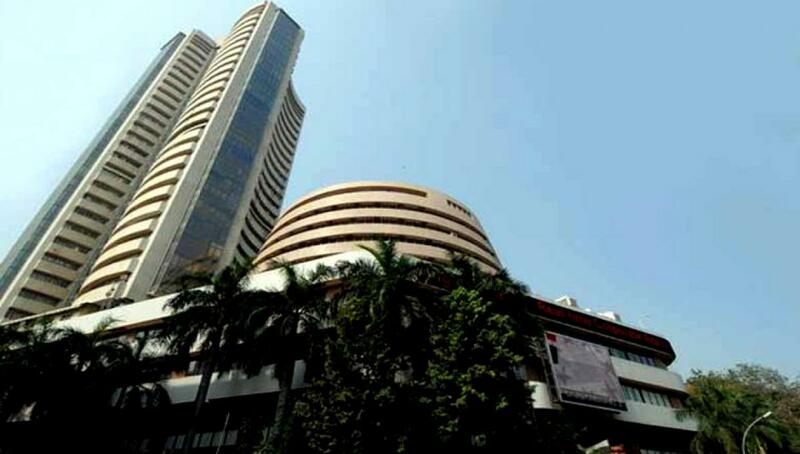 Major Sensex gainers in Friday's trade were: Vedanta, up 5.70 percent at Rs.96.35; ONGC, up 5.55 percent at Rs.243.55; Bharti Airtel, up 4.29 percent at Rs.362.25; Bajaj Auto, up 3.65 percent at Rs.2,269.20; and Gail, up 3.17 percent at Rs.289.80. The major Sensex losers were: Sun Pharma, down 2 percent at Rs.884.95; Lupin, down 1.89 percent at Rs.1,862.70; Coal India, down 1 percent at Rs.357.40; Tata Consultancy Services (TCS), down 0.27 percent at Rs.2,570.65; and Larsen and Toubro (L&T), down 0.24 percent at Rs.1,616.90. Among the Asian markets, Japan's Nikkei gained by 3.03 percent. Hong Kong's Hang Seng fell by 1.04 percent. In Europe, London's FTSE 100 index slipped by 0.51 percent, French CAC 40 tumbled by 0.34 percent and Germany's DAX Index dropped by 0.49 percent at close of trading here.